The following melancholy details of the loss of two Transports off the Old Head of Kinsale, has been communicated by a Gentleman of that town, who had an opportunity of learning the dreadful particulars stated. No later intelligence has been yet received, though it is momentarily expected. The loss of these vessels is accompanied with the afflicting further information, that they were full of troops, consisting of the 59th and 62th regiments, and it is added, in the accounts which have reached us, a detachment of the 82nd. The first information of the loss of the two former vessels reached this city yesterday, and it would be difficult to describe the sensations it created among all persons, at the melancholy fate of so many gallant men, who, after having survived all the perils of war, thus met their deaths within sight of a land where an affectionate and hospitable reception awaited them; and it may be easily supposed ,that the public regret was not lessoned when it became known, that numerous females, the wives of these poor fellows, and their companions through many a former danger, with their numerous children, shared their melancholy fate. Nothing official has yet been received relative to this disastrous event; the officers who have survived have been directed from headquarters here to transmit the detail of the loss as soon as it can possibly be made out, but at upon this day it had not arrived. In the meantime the following particulars are furnished by an intelligent Gentleman from Kinsale. We have had different accounts of the number of the detachment; the Kinsale accounts make it very considerable, and other accounts, which deserve some consideration, being from persons connected with the regiment, making it much less.- For the present, while there is a possibility of mistake, we shall abstain from mentioning the particulars of either estimate. Suffice to say, that only fifty or sixty escaped from the brig. We have heard the name of one of the Officers of the 82nd who was saved- we announce it with great pleasure, for the relief of his family and friends, Lieut. Starkey. Yesterday morning the Sovereign of Kinsale Governor Browne and Collector Meade were most actively employed in procuring clothing provisions and medical assistance for the poor surviving sufferers. As soon as they made the necessary arrangements, they repaired in person to the wrecks, and from the cordial co-operation which they received from the inhabitants of the town, of all ranks and description, they have no doubt been enabled to afford the most timely and effectual relief. The brig has gone to pieces, and it was imagined, that the ship would share the same fate in the course of last night. In addition to the above we have to lay before our readers another most distressing account of a similar nature, but which we trust will not be found so disastrous as the letter states, which was received here this morning from Waterford. 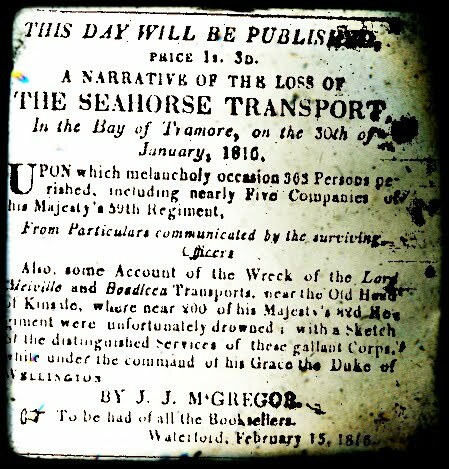 I am sorry to have to state to you, that the Seahorse transport, bound to your port, with part of the 59th Regiment on board, was lost yesterday, at Tramore, and that 379 persons perished. Custom House, Kinsale, January 31, 1816. I beg leave to inform you, I had an Express at 5 o’clock yesterday evening, from the lieutenant at the signal tower at the Old Head, stating that a large ship and a brig were embayed in Courtmasherry Bay, and he feared from the desperate of the weather that they may be ashore; and in half an hour after, I had an account to say, that the ship was on shore near Garretstown Strand, and that the brig was lying to an anchor in the bay; that they were transports from England, with part of the 59th and 62nd and, I believe the 82nd regts on board; and that a boat coming from the ship to the shore, with two Officers, two Officer’s wives, a child and some others were upset, and all drowned. I lost no time in applying to the commanding Officer here, for a party of twenty men and an Officer, and although the night was most desperate and dark, yet with great difficulty, I sent the party across the ferry here, at ten o’clock with the Port Surveyor, Mr Pratt, the Coast Officer, Mr Newman, and some more Revenue Officers, to be ready to give every assistance possible both to protect the vessel and save the lives of those on board. An Express has just returned to me, with an account, that all of the soldiers and everyone on board the large ship, got on shore safe (except those I mentioned that were lost in the boat) at low water, about one o’clock this morning; but I am sorry to say, the brig parted from her anchors about two o’clock and swept on shore, and almost everyone on board has been lost; there are a few of them that got to the shore with broken limbs, and the whole is one of the most melancholy sights that ever happened on this coast, the strand being covered with dead bodies. 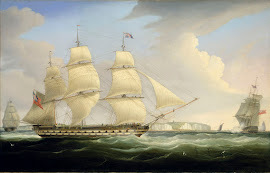 The name of the ship was the Lord Melville and had six companies of the 59th and two of the 62nd, and the wives of Captains A Mancor and Fawson, both of the 59th, are the names, I understand, of those that were drowned. The brig had part of the 82nd on board from Dover. This information has been given me from a corporal of the 59th, who has just come from the wreck. I have this moment sent an express to the Commander of the Fort, Lord Forbes, at Cork, with a particular account of this melancholy business, and I have sent another detachment of twenty men to assist in every way possible in preserving the arms and everything belonging to the vessel- and the Governor of the Fort, the Sovereign, and most of the principal gentlemen of this town are endeavouring to get there, to afford every assistance possible, and I am happy to have it in my power to tell you that the country people have as yet behaved in the most exemplary manner, and afforded every assistance in their power to the unfortunate sufferers. I have also sent every Surgeon; I could get in this town, to render assistance to those that have broken limbs, as some of them had the misfortune to have suffered this way. We lay before our readers letters from Colonel Darley, and Collector Meade, of Kinsale, to Lord Forbes, containing official accounts of the disastrous occurrences that have taken place near Kinsale. The loss of lives, though lamentably great, falls short of the exaggerated statement that public anxiety first circulated. Too much praise cannot be bestowed on the spirited and benevolent exertions of the Collector of Kinsale, throughout this arduous business; and it would be unjust to withhold the highest tribute of applause from the skill and activity displayed by lieutenant Harty. 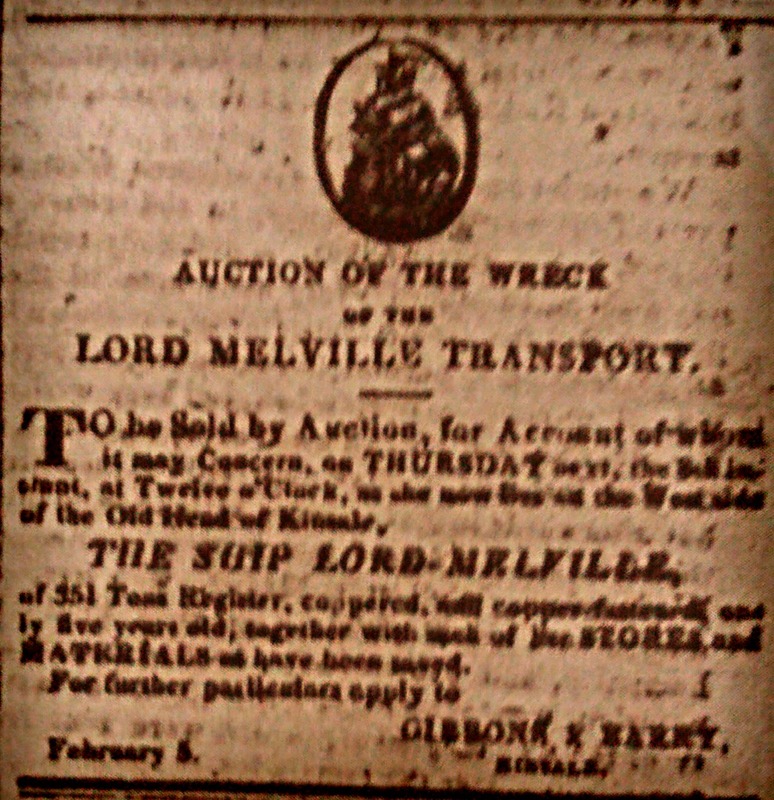 My Lord, I have the honour of availing myself of the earliest opportunity that has been allowed me since the disaster of our unfortunate ship, the Lord Melville, to report to your lordship the arrival of his Majesty’s troops that were embarked on board her under my command, accounting for the casualties that occurred by the wreck, and a brief statement of the misfortune. Upon making the land, about 11 o’clock AM on 31st ult (having laid to the previous night) it blowing nearly a gale of wind, a heavy sea running, and the atmosphere so thick and hazy, that, upon discerning the land, we found ourselves nearly embayed. The master bore up to weather what was universally supposed the entrance into Cove, but which proved to be the Old Head of Kinsale, and after every assertion to weather that point, and run the ship into Kinsale harbour, he was compelled to bear away for some friendly looking strand upon which he might run up the vessel, and await the going out of the tide, in the hope of saving the lives of so many souls, very justly not holding in competition the ultimate security of the ship. In endeavouring most ardently to affect this object; the vessel was irrevocably driven upon a bed of rocks by the violence of the gale, distant from between three and four hundred yards from the shore, the tide then making in. No time was lost in passing a rope from the ship to the shore, and cutting away the fore and main masts, to ease the tremendous shocks of the ship against the rocks, by which her bottom was almost immediately stove in, and several feet of water in her cabin. At this time, it was about three 0’clock PM, our situation becoming most critical, by the violence of the sea breaking into the cabin and over the stern, together with her continual dashing against the rocks, a boat was manned for the ladies on board, to endeavour making the shore: two Officer’s wives, with their servants, soldiers of the 59th regiment, six of the crew, together with Captain Radford, of the 62nd Regiment (who was in a week state of health), got into the boat, and made for the shore; but; distressing to add, they had not reached half way, when the boat was swamped, and, with the exception of one sailor, all perished. Nothing possibly remained for those on board but to await, with hope of preservation, the falling of the tide, when, should the vessel keep together, it was determined to lash a long spar from the bow to the nearest dry rock, and pass every person over it, to make good their way across a range of rocks that extended to the shore. Between ten and eleven o’clock, the attempt appeared practicable, and to my greatest satisfaction, succeeded beyond our utmost hopes. After the lapse of some time, every individual having happily descended from the ship, without any accident, Lieut. Harty, of the neighbouring signal station, with a party of men, after the most praise worthy exertions, had arrange those men along the rocks, with lighted sticks, affording the most essential assistance, and thereby preventing the loss of the lives of several who would otherwise have certainly fallen into the many large recesses of deep water that encompassed and obstructed our progress to the main land, and over which the breakers occasionally washed. Every person having at last safely reached the shore, Lieutenant Harty, with equal promptitude, had arrange for their being distributed amongst the neighbouring cabins, and they were marched off accordingly, to return early next morning, for the purpose of endeavouring to get out the arms and accoutrements; nothing, however, could possibly be affected towards that end by the early return of the tide, and consequent impossibility of access to the ship.. The few men and some officers that were enabled to return on board, reported to me the near total destruction of all the baggage, from the sea it was swimming in, and the pillaging that took place after the troops were got on shore. Finding the men much in need of repose, and the day advancing, I directed their proceeding to Kinsale, leaving two officers’ parties from the 59th and 62th regiments to remain in protection of the ship, conjointly with a party from the Limerick Militia, and with instructions to commence early next morning (1st Feb), in getting from on board, the arms and accoutrements. I have since dispatched a stronger relief to those parties and shall continue using every exertion until I shall succeed in securing, I hope as many stand of arms, &c as it is possible, which I shall have the honour of reporting for your Lordships information. I beg leave to express to your Lordship the very great support and active assistance that have been afforded by Governor Browne, Collector Meade, and the Magistrates and Gentlemen of Kinsale. I am happy in concluding this, my Lord, by a report this moment received, that all the arms and accoutrements have been safely landed and will arrive here this evening. The troops have undergone much fatigue, and are making without necessaries; I therefore hope time may be given to recover themselves and get into some order. From the brig that has been wrecked (Boadicea) with part of the 82nd regiment on board, I understand that out of 280, only 50 have been saved and two officers. I have the honour, &c, &c.
Embarked on board the Lord Melville Transport, of the 2nd battalion 62nd Regiment. One Colonel, 1 Captain, 2 Lieutenants, 3 Ensigns, 75 rank and file, 1 servant, 6 women and 2 children. Lieutenant Colonel Darley, Capt Radford, Lieutenant Mahon, Lieutenant Whitfield, Ensigns Whitney and Sweeney.- Lost captain Radford. Total one. Embarked on board ditto, of the 2nd battalion, 59th Regiment. Three captains, 8 Lieutenants, 3 ensigns, 260 rank and file, 2 servants, 33 women and 30 children. Captain Fuller, Captain Mancor, Captain Fawson, Lieutenants Duncan, Pitman, Hill, O’Hara, Edwards, Robertson, Carmichael, Assistant Surgeon Colvin, Ensigns Stewart, Ward and Proctor. 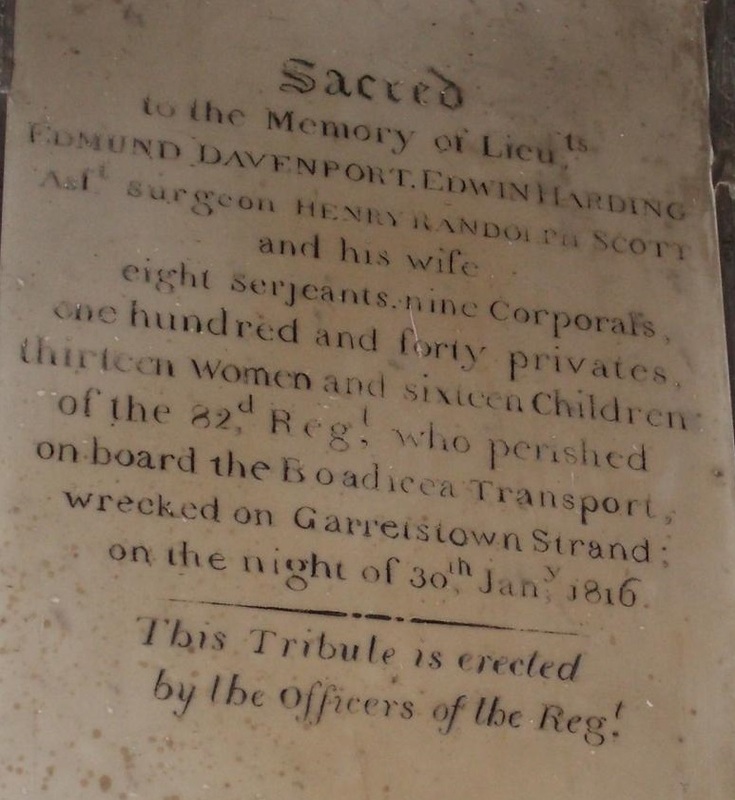 Lost, Mrs Mancor, wife of Captain Mancor, Mrs Fawson, wjfe of Captain Fawson, Mrs Weld, wife of Serjeant Weld, Mary Weld, her daughter.- Privates, John Wheatly and Richard Mooney. Total 6. My Lord- As an opportunity offers going to Cork, I write to acquaint you, that, on my return from the wreck last night, I had the honour to receive your letter of yesterday, and as you may be anxious to know particulars, I beg to acquaint you, that every person on board the Lord Melville transport, of the 59th and 62nd Regiments, got safe on shore, at low water, except the eleven I mentioned to you that were upset in a boat coming from her, and were drowned. Two hundred and five non-commissioned officers and privates, fifteen women and eighteen children. And I should suppose, near eighty privates, but it is impossible as yet to be exact as to the numbers, as several of them that were bruised and hurt, are in the cabins about the place. The wife of the last also perished. The brig Boadicea lies in pieces on the rocks, covering almost all the dead bodies, and we were able yesterday to get out of her about 140 stand of arms, which I have got safe to the Custom-house, and this day they are endeavouring to get out the remainder, and bury the dead; in short every exertion is making use to save everything, and to afford relief to the unfortunate sufferers. The detachments of the 59th and 62nd, that were on board have not as yet been able to get either their arms or any of their baggage, but as the vessel remains entire on the strand, I should hope if the weather moderates in a day or two, they may be able to save a good deal.